I'm Here. I'm Queer. What the Hell do I read? : The SCBWI 2010 Summer Conference: Day One! I'm really excited - it's one of my favorite times of the year - The Society of Children's Books Writers and Illustrators' Summer Conference here in Los Angeles. Tweets about the conference will be under #LA10SCBWI - you can follow that hashtag to keep up with all the twitter talk! And you can follow me on Twitter here. Friday Morning: Jon Scieszka's Keynote - this should be amazing - he was the very first Ambassador for Young People's Literature in our country! Also, M.T. Anderson's Keynote - he is such an incredible writer and you must check out the interview he did with me - I learned so much from his answers, and it's one of the talks I'm MOST excited about from the whole conference! Come join me, Lambda Literary Executive Director Tony Valenzuela, and Vice President at Scholastic Inc. and the Editorial Director of Arthur A. Levine Books, Arthur A. Levine in an informal discussion about Writing and Illustrating for LGBTQ and Allied Kids and Teens. After lunch there's an editor panel with Claudia Gabel, Brenda Murray, Jennifer Rees and Nick Eliopulos (you can check out my pre-conference interview with Nick here), moderated by Krista Marino. That should be stellar. There are fantastic morning and afternoon workshops - so many it's hard to choose!, an afternoon keynote by illustrator Loren Long, and even peer critiques and yoga at night! There's also an informal non-fiction "mixer" happening at 7:30 p.m. in a room called Olympic 2 - Thanks to Alexis O'Neill for the heads up on that! 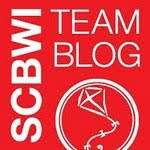 I'll be at this first day of the conference having a grand time, learning a ton, and working with the rest of SCBWI Team Blog to capture a taste of all the excitement for everyone. If you get a chance, stay "Hi!" I went to the SCBWI conference in Seattle this spring and you're making wish I'd headed down to LA!